What is wrong with the economy of Finland? Several renowned international bloggers and journalists, including Jason Karaian, Ambrose Evans-Pritchard and Simon Nixon, have recently pondered on this issue. A citizens' petition, motivated by the economic woes of Finland, demanding referendum on the euro membership has also put Finland en route of becoming the first country of the Eurozone to test the will for further European integration. But, why is the economy of Finland struggling? The answer lies in the historical legacy of strong labor unions and in the narrow industrial base, which make Finland an uncanny member of the European single currency. The rise and fall of the Nokia Ltd. was just a blimp in the "big picture", but it happened to occur during the creation of the euro, which biased the ability of Finland to prosper as a part of the monetary union. The industrial production of Finland has been based on four broad categories since the beginning of the 19th century: forestry, metals, machine works and refining products. Textile industry had a big role in the industrialization of Finland in the latter part of the 19th century, but it has then almost vanished. After establishing her own currency, the markka, in 1860, Finland, a Grand Duchy of the Russian Empire, quickly fixed the external value of its currency to gold. 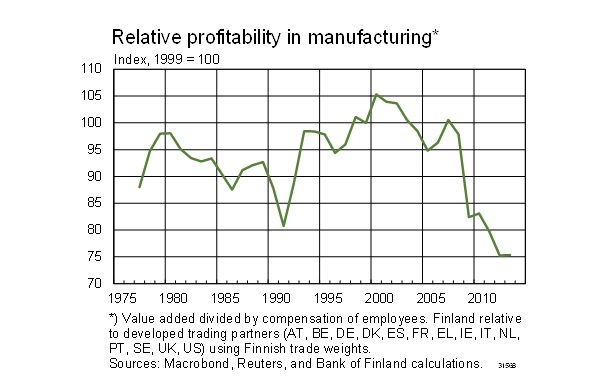 This did not pose a problem for the economy, because Finland followed a liberal economic doctrine. This meant that wages and prices fell in recessions and rose in upturns stabilizing the demand and supply of labor. However, this changed drastically after labor unions were formed at the beginning of the 20th century. Wages and prices became rigid, which meant that recessions led to considerably higher levels of unemployment than before. After the independence (in 1917) and a Civil War that ensued, Finland re-joined the gold standard in 1923. However, Finland was forced to break off from it in 1931 because her main export partner, the UK, suspended the convertibility to Gold earlier that year which led to a depreciation of the English pound of around 30 % against the US dollar. After the Second World War, Finland established a growth model where monetary and fiscal policies were used to channel resources towards industrialization. The instruments of choice to accomplish this were comprehensive income policy settlements through a centralized wage negotiation system and repeated devaluations. The model led to a classical boom-and-bust devaluation cycle. Economic booms were followed by inflation and claims by labor unions for higher wages, but the wages did not come down in downturns forcing monetary authorities to devalue the currency to maintain the competitiveness of the export sector. Between 1957 and 1991 Finland devalued the markka six times. During the depression of 1990 - 1994, which was caused by an over-investment boom and the fall of the Soviet Union, Finland was forced first to devalue the markka and then let it float against other currencies. The period of the floating markka was described by monetary calm and very fast economic growth. During this period, Finland also made a qualitative leap from resource-based economy to knowledge-based one with the ICT as the leading sector. The peak of this transformation coincided with the beginning of the euro membership in 1999. 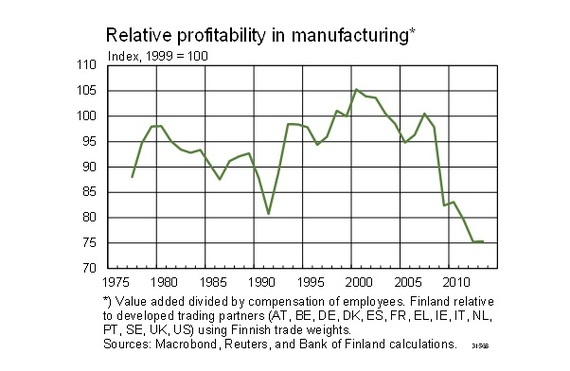 The fast growth of productivity during the late years of the ICT boom (around 2000-2005) masked the decline of competitiveness and profitability of the manufacturing industry (see Figure 1). Figure 1. Source: Kajanoja (2015). 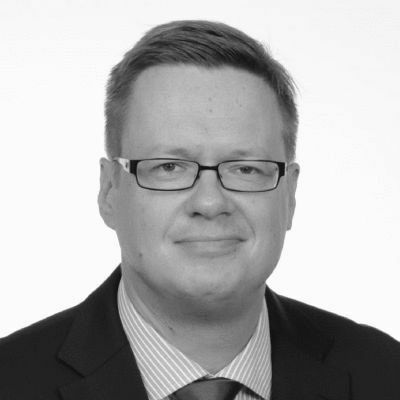 Paljonko kustannuskilpailukyvyn pitäisi parantua? The Finnish Econonomic Journal, 3: 361-372. Competitiveness eroded because unit labor costs in the manufacturing and in the intermediate product sectors rose sharply following the rapidly increased wages of the ICT sector. The deterioration of the profitability was exacerbated by the mediocre development in the value of the production of the manufacturing industry in the global markets. After a brief recovery period between 2006 and 2008, the competitiveness of the manufacturing sector basically "fell of the cliff" (see Figure 1). The same happened to overall productivity (see Figure 2). So, when Finland decided to join the euro, its economy was in the middle of a massive ICT boom which fostered growth in productivity and in the GDP per capita. Because of the centralized wage negotiation system and strong unions, high productivity growth in the ICT sector led to high wage increases also in other sectors where productivity growth was not so high. 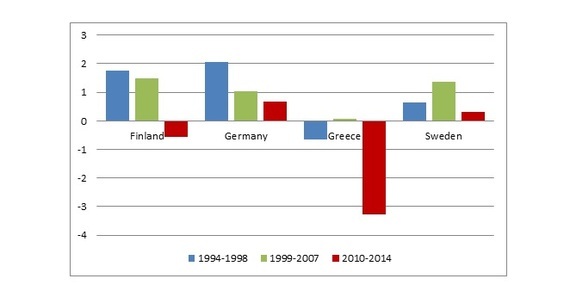 All historical facts point to the same conclusion: Finland should never have joined the euro. If Finland would have its own (floating) currency, it would depreciate against other currencies when there would be fall in global demand, the exchange rate of her main export partners would depreciate or when there would be an increase in the domestic production costs (e.g., wages). When Finland joined the euro, it gave up this instrument. The industrial production of Finland has become too expensive for the depressed global demand and the currency of one of her main export partners, Russia, has depreciated heavily against the euro due to the economic recession. Taking into account the economic woes Finland is currently experiencing, Finns should seriously consider of leaving the bloc. In the history, monetary unions have always broken down (either partially or completely) without a functional federal structure. EuroThinkTank found in their report published last year that euro will eventually follow this path. That is, it will either develop into a full federal union or break-up. Eurozone currently has a serious deficit on democracy. Parliaments in Greece, Portugal and Italy have been reformed to follow the economic and political doctrines of European creditor nations. It may be naive to think that the European leaders would return to the founding principles of Europe, equality, fraternity and liberty, but one can always hope. On this, Finland could become a pioneer.